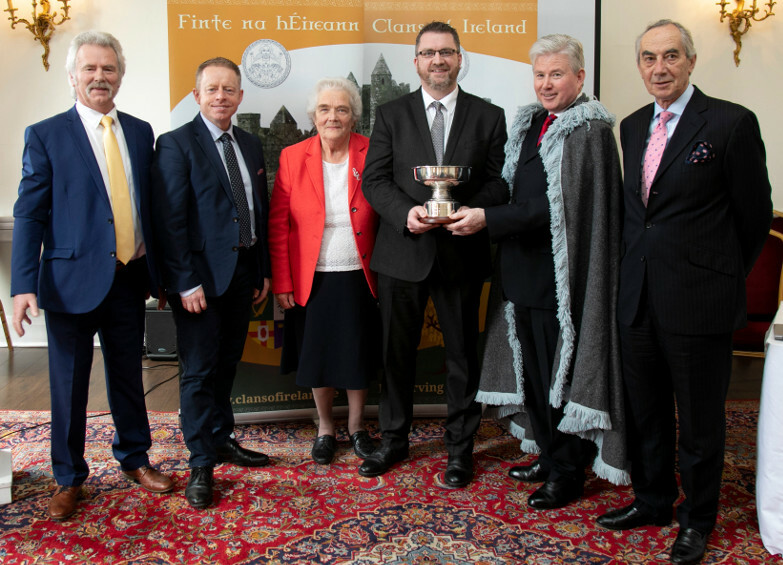 Photo above: Tuam librarian, Ruairí Ó hAodha, winner of the 2017 Chiefs’ and Clans’ Essay Competition, receiving his prize and trophy during the 2018 Clans of Ireland AGM and Conference in Dublin. Also in the picture are (L-R) Dr Joe Mannion, Minister Ciarán Cannon TD, Ms Maura O’Gara-O’Riordan, An tUasal Gearóid Ó Ceallaigh and Conor, The O’Brien. The Irish Chiefs’ and Clans’ Prize in History for 2017 was presented at the Clans of Ireland AGM and Conference in The Stephen’s Green Hibernian Club, Dublin on Saturday 14 April 2018. The recipient, Ruairí Ó hAodha, a librarian in Tuam, Co. Galway, had earlier been declared the winner by the chief adjudicator of the competition, Dr Katharine Simms of the History Department, Trinity College Dublin. The prize-winning essay was entitled “‘A very sufficient scholar”: Isaac Lally, Ireland’s Stuart schoolmaster’. Entries for this prestigious competition came from all over the country, dealing with aspects of the political, social or cultural history of Gaelic Ireland, such as kingship, lordship, land-holding, genealogy and family history. The annual competition is organised and jointly sponsored by The Standing Council of Irish Chiefs and Chieftains and Clans of Ireland, in association with the History Department of Trinity College, Dublin and History Ireland magazine. For further details, see https://www.tcd.ie/history/irishclansandchiefsprize.php.